Kevin Hassett, chairman of the White House Council of Economic Advisers, has expressed support for a carbon tax for years. In 2007, he wrote that it would be a "no regrets policy" that could address climate change without harming the economy. Hassett co-authored a paper in 2007 as a resident scholar at the American Enterprise Institute with Steven Hayward and Kenneth Green, both of whom were AEI fellows at the time, to tout the benefits of using a carbon tax to reduce corporate and income taxes and to cut greenhouse gas emissions. That would be less damaging economically than a cap-and-trade program, they said. "A program of carbon-centered tax reform, by contrast, lacks most of the negative attributes of cap-and-trade, and could convey significant benefits unrelated to GHG reductions or avoidance of potential climate harms, making this a no-regrets policy," they wrote. "A tax swap would create economy-wide incentives for energy efficiency and lower-carbon energy, and by raising the price of energy would also reduce energy use." In a separate paper, Hassett, who has been a researcher at the Federal Reserve as well as on the faculty at Columbia University, suggested that "concerns over the distributional impact of a shift to a carbon tax may be overstated." Yesterday, Hassett said he has a long record of supporting carbon taxes, but would not say if he has broached the subject with Trump, who rejects climate science. "I've written a lot about the economics of carbon taxes and how they work, who pays them, and my record in that space is clear," Hassett said in response to a question from E&E News. "But conversations I have or don't have with the president are deliberative and subjected to executive privilege." 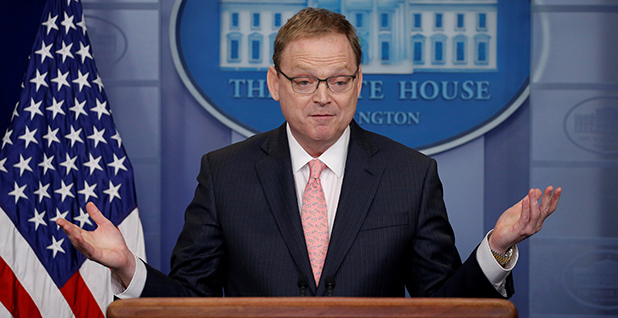 Instead, Hassett and other government economists credited the administration's deregulatory agenda as an effective tool for building the economy. The administration is rolling back a number of climate rules adopted by the Obama administration, including tighter vehicle emissions standards and power plant pollution controls. The Trump administration claims that federal agencies saved $23 billion in regulatory costs, and that it issued 12 deregulatory actions for every new significant regulatory action. "Deregulation is part of the story there, deregulation both in energy and in banking, because bank loans are an important part of that industry; also, technological innovations and conditions in some of the world's markets have contributed here. But the amazing result is United States oil production has passed all other countries in the world, passed Saudi Arabia, passed Russia, and we're producing like never before," said Casey Mulligan, the chief economist at the Council of Economic Advisers. Trump and many congressional Republicans have mocked the Green New Deal proposal, a Democratic initiative that envisions a societywide effort to address climate change and poverty through a huge public jobs program. Some Republicans have argued that the party needs its own plan to address climate change, instead of ignoring the body of climate science that predicts a cascading set of risks in a warming world.